From the Lama Foundation I went to T or C NM. I wanted to visit my friends at the Sycamore Ranch, where I used to live and work, and show them The Eye of the Dragon; the ranch has a chapter in it. On my very first day, a woman called the police (as I entered the public swimming pool) due to my “suspicious” bag. My gym bag was suspicious? I asked the police officer as he inspected it. He shrugged his shoulders, but then he asked me about my bumper stickers. I told him that there was evidence that 9/11 was done by controlled demolition. Then I realized the profound effect my stickers have on people that want to ignore the truth. I was stopped three times, during my short stay in T or C, with one pretext or another (I guess T or C wants to ignore the truth, or do nothing about it). Those stickers are doing their job (I have one on each side). 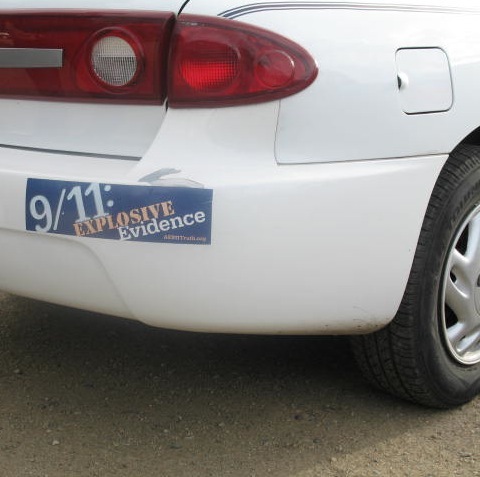 It would be great if more people would do their job and do something , maybe use a bumper sticker or two. But let me tell you, whether they want to or not, the truth will be known and a new consciousness will sprout, a system so corrupt has to be changed. The time has come. Do your part, do something! Spread the word somehow! Do it for your kids.